A blog post series is an editorial calendar’s best friend. 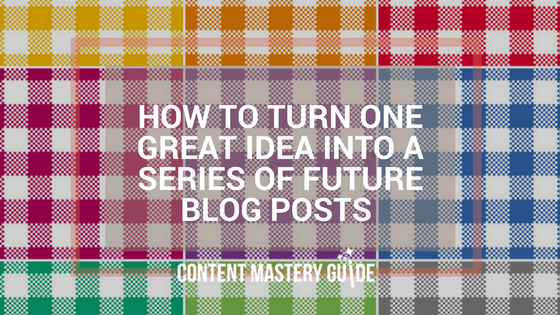 From one topic idea, you can produce multiple posts that keep your blog fresh for weeks or even months. But how do you know when an idea is worthy of a blog post series? You have different customers with related problems. For example, a nutritionist who blogs about how a particular vegetable or superfood helps the immune system could do follow-up posts about its benefits for sleep quality and weight loss. You’ve made a list. If you’ve already written a Top 10 (or 5, or 3) post, you have a natural launching point for delving deeper into each idea. Your writing is overflowing. You start writing and as you get into the flow, it turns into a long post that is no longer focused on a single topic, but is now a collection of related ideas. Your readers are asking for more. You’ve received several frequently asked questions that each warrant their own focused post. You have a theory about something. Sometimes you’ll want to teach your readers a deeper, more complex system or explore aspects of a theory you’re working on. Step 1: Compose an introduction to the series. Sometimes this will be a stand-alone post. Other times, your introduction will be part of the first post of the series. Step 2: Look at what you’ve written and find the natural breaking point(s), where you’ve finished talking about one element and you’ve started talking about another one. Step 3: Decide on a format for each post in your series – will they be quick and to-the-point, or use a more formal article layout? Step 4: If you’re going with a typical article format, compose an introduction and conclusion for each of your blog posts. Step 5: If you’re keeping things simpler, just insert each separate point into its own blog post, using the format you chose (e.g., sub-headings such as Name of Tip/Resource, When to Use, Other Suggestions). Independence: Assume people are reading each piece as a stand-alone blog post. They may never read the related posts, or they may read them in a different order than you wrote them. Make sure each post makes sense on its own. Links: Help readers navigate the series by adding links to the other posts as they’re published. You can list these separately at the bottom or top of your posts, or use anchor text links within a sentence. Language: Use the same words and phrases in each post, in order to reinforce your unique writing style and personality. Above all, try to use the same language that your typical customer might use when they discuss the topic. Group: Create a tag with a unique name and web address (“slug”) and assign that tag to each of the posts. Once you’ve published the first post, look for the name of the tag in the byline or footer of your post (depending on your site design). Click on that link and copy the URL from your web browser. It might look something like this: https://www.contentmasteryguide.com/tag/types. That is the link where people will find all posts with that tag, as long as you remember to add the tag to each one. Promote: As you promote each individual post via social media, use the series link you created above to invite readers to view the whole series. Use Buffer or another tool to schedule future posts as well. Why stop at one post when you’ve discovered a juicy topic that could help your ideal clients in multiple ways? Use these blog post series tips to keep delivering high-quality content for weeks or even months to come.